Published 3rd January, by Tom. | 10 comments. I hope that you had a fantastic holiday period and spent some quality time with friends and family. I know that we certainly did! After a fantastic first 3 months, I wanted to give a quick recap and let you know what we’ve got in store for you this year. First of all, a huge thank you for genuinely being the best community I’ve seen online. The daily emails, tweets and comments we receive certainly make the long hours more than worthwhile. It’s amazing to see the incredible talent and creative diversity in our audience, as you may have seen in our community creations series. It’s also nice that we can be comfortable enough with you guys to be as ridiculous as we were in our official Christmas video. (Check it out if you have’t seen it yet, and enjoy the freebies included). Many of you seem to get value from every deal and tutorial we put out, and it’s so encouraging to know that what we’re putting out is helping you and your work. In fact, after recently crossing $750,000 in community savings, we look set to smash the big $1 million mark this month. Look out for another monster giveaway to celebrate and let us give back to the Design Cuts community. In terms of our plans for 2014, I don’t want to share everything, as we hope some of our upcoming features will be a lovely surprise for you. A much requested archive for past tutorials is coming soon. This will let you easily browse all of our tutorials from past deals. We’re planning out some great new ways for you to share your work with us, and for us to give you exposure to the Design Cuts community. Stay tuned on this one. We’re listening carefully to which deals will help you the most, and have some crackers lined up for the next few months. Our current Ultimate Creative Font Bundle deal is already proving one of our most popular ever. We’re looking at setting up some very special live events, where you’ll be able to tune in for further training and fun community stuff. If you haven’t yet approached us, then please email anytime, as we love chatting with each and every one of you. Your feedback helps us shape Design Cuts, and we make a note of every email. 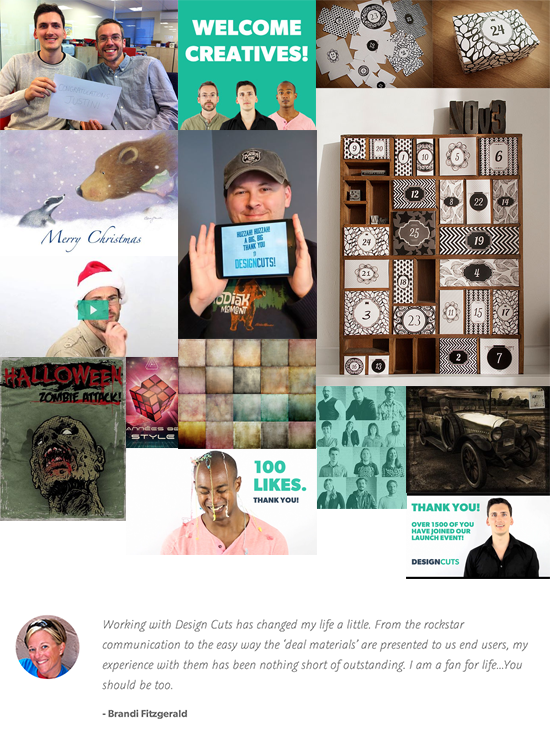 We hope you love what we have in store for 2014, and we hope you’ll use this year to take your design work to the next level. – Tom, Matt and Darren (The Design Cuts Team a.k.a The Creative Geeks). Tom is one of the founders here at Design Cuts. Like the rest of the team, he's a massive design geek, and loves nothing more than connecting with our awesome community :). Wow, I think we’re gonna need a bigger boat…. Yeah, 2014 should be big! Yay – 2014 started off very well with bookings for work starting on the 2nd! I love my job! Fantastic news, well done Jo! I’m sure 2014 will be a great year for us all. Happy new year Rosy! You have some really interesting work in your portfolio btw. Keep it up :). Sounds awesome! Just in line with all of the quality stuff you guys do! Thank you. Thanks Stephanie, we’re keen to work even harder to help you guys this year. I appreciate the support! sounds FAB. Look forward to more from you during the year. Thanks Stephanie! Great to have you with us :).